Model 1905 serial number 5473 - A very unique Model 1905 with an interesting history. The pistol is inscribed "Col. John Caswell" on the back strap and is complete with the original holster. The Colt Factory Letter indicates that this pistol was a one gun shipment shipped on July 11, 1911 to Von Lengerke & Detmold, 349 Madison Avenue, New York, NY. The history behind this gun is that it was special ordered by Col. Caswell to take on an African safari. 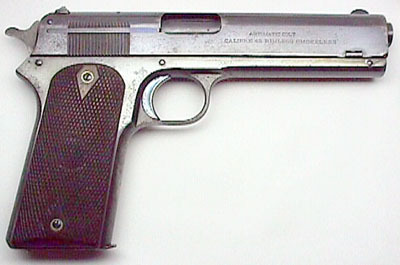 While on the safari, his hunting party was attacked by natives and Caswell had to use this Model 1905 to defend himself. He was so disturbed by what transpired that when he returned to the States, he eventually gave the gun to a friend of his who was the president of a bank in South Carolina. 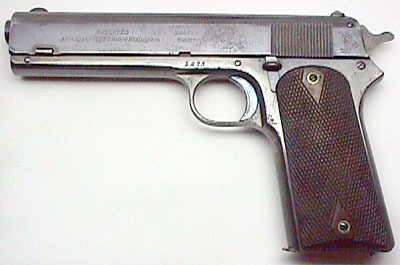 The gun remained in the same family for more than two generations. 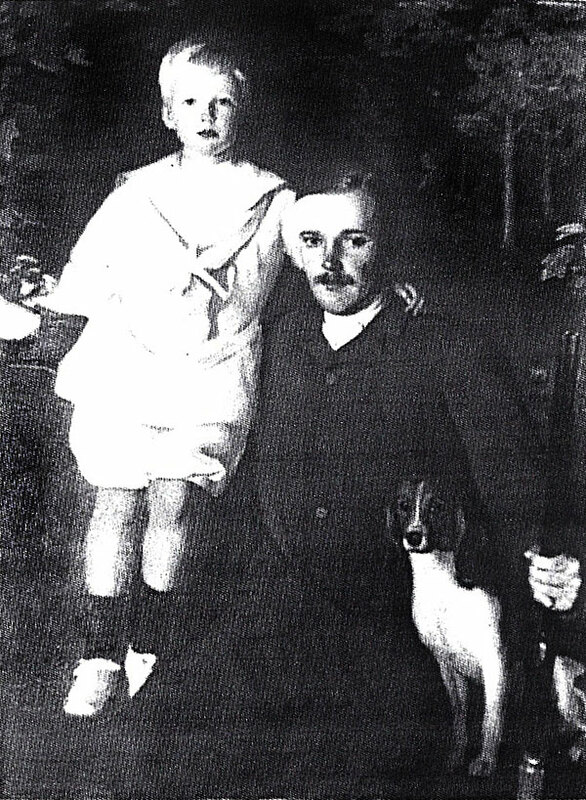 Col. John Caswell, John Caswell, Jr. & "Dainty" by Charles Hopkinson (ca. 1907) - image courtesy of Brad Caswell. Col. John Caswell (Dr. William Halsted7, John6, William5, John4, Job3, Thomas2, Thomas1) born 16 Jan. 1873, New York, NY, married 12 Sept. 1894, Beverly, MA, Gertrude Robbins, born 31 May 1870, Lynn, MA, (daughter of Royal Elisha Robbins and Mary Elizabeth Horton), died 1951, Boston, MA. John died 8 Feb. 1935 at the home of his aunt, Mrs. Wesley Watson, in Cadgan Gardens, London, England, buried Woodlawn Cemetery, Bronx, NY. Col. John Caswell's personal notes provided much of the information for his family. At least some of the notes were made within the last 5 years of his life as he mentions the birth of his brother's granddaughter, Virginia Lee Caswell, in 1930. He notes that he was baptized in haste at the age of one week. Being only 5 lbs. in weight he was thought to be too weak to survive. His obituary is paraphrased below. John spent three years at Harvard College and one year at Harvard Law School. During much of his life he made his home at Prides Crossing, MA, and served in the state's militia and the Federal Officers Reserve Corps. He attained the rank of colonel, chief of ordnance, in the Massachusetts militia. Before the US entered World War I, Colonel Caswell served as an ambulance driver in France in an American volunteer unit with the French Army and in 1915 he presented an ambulance to the unit. Later he was a major of ordnance with the American Expeditionary Force. The lure of big game hunting twice took him to Africa where his kill included several world records. Trophies of his hunts can be seen in the American Museum of Natural History, New York, the Agassiz Museum at Harvard, and the St. Mark's School in Southborough, MA. He was interested in the study of small arms ballistics and the use of military and sporting rifles. His book SPORTING RIFLES AND RIFLE SHOOTING is ranked among the authoritative works on the subject. i John Caswell Jr. born 10 Feb. 1898.
ii Elizabeth Robbins Caswell born 9 Aug. 1901, Beverly, MA, married Sept. 1923, John Mitchell, (son of Walter Mitchell). She married (2) before 1954, Robert B. Choate who died 1966. Elizabeth died 3 Aug. 1987. She was living in Locust, NJ with her first husband in 1931. She was living in Danvers, MA in 1954 and at the time of her death. A host of riflemen will learn with regret of the death of Colonel John Caswell on February 9th, after a five-months' illness. Colonel Caswell died in London but was buried in Woodlawn Cemetery, in New York. He was sixty-two years old. Colonel Caswell was one of the most generous riflemen ever associated with the National Rifle Association. He was a member not only of the National Rifle Association of America, but also of the Dominion of Canada Rifle Association and the National Rifle Association of Great Britain. His gifts of money and trophies and his contribution of technical advice were always generous. He was commissioned Colonel and Inspector General of Small Arms Practice on the staff of the Commander-in-Chief for the Commonwealth of Massachusetts on August 31, 1907, and shortly after that was commissioned colonel and Chief of Ordnance in the Ordnance Department of that state. In 1915 he served as an ambulance driver with one of the American volunteer units attached to the French Army, and later purchased and presented an ambulance to that unit. He returned to the United States to instruct the first Plattsburg camp in small arms marksmanship in 1916. When the United States entered the war, Colonel Caswell was commissioned a Major of Ordnance in the A.E.F. Trophies from his African hunting expeditions are now located in the American Museum of Natural History, at New York, the Agassiz Museum at Harvard University and at St. Marks School, which Colonel Caswell attended in his youth. He was probably best known to the present generation of riflemen through his book, "The Sporting Rifle," and through the Caswell Trophy, which is one of the most important of the several National Small Bore Trophies competed for annually at Camp Perry. The game has lost one of its finest sportsmen. John Caswell has answered the last muster. 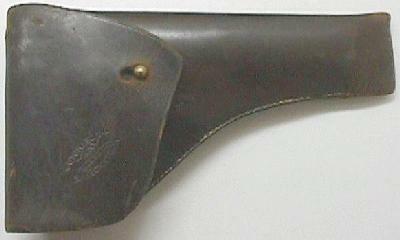 The original holster for Col. Caswell's Model 1905. 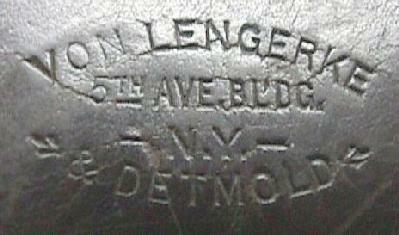 Holster is marked on the flap "Von Lengerke & Detmold, 5th Ave. Bldg., N.Y."